A downspout is an essential part of your gutter system and many problems can occur if it's not functioning properly. Check for pooling water and drainage issues near downspouts and gutters which can cause flooding and foundation problems.Also high winds can loosen downspouts and even break them. A downspout that is not properly secured can cause damage to the gutters and roof, allowing water to discharge next to your building foundation. Water that is allowed to run from your gutter and downspouts directly into the ground can cause a flooding that may end up in your crawlspace or basement and can wear away the soil alongside the house, causing settling of the structure. If you find water in your basement or crawlspace don't hesitate to contact SERVPRO, we are here to help in any disastrous situations. If you find yourself dealing with contaminated water, from a water loss, call in the SERVPRO experts for help. Category 1: "Clean Water" is from a clean source like a broken water line; however, if left untreated, can degrade into a category 2 or 3. Category 3: "Black Water" comes from flooding rivers or sewer backup and may contain untreated sewage, harsh chemicals, and microbes. Let our highly trained experts help you decipher what needs to be done and walk you through the process. We are open 24/7, and 7 day's a week. Have questions? Call SERVPRO today at 817-596-8714. 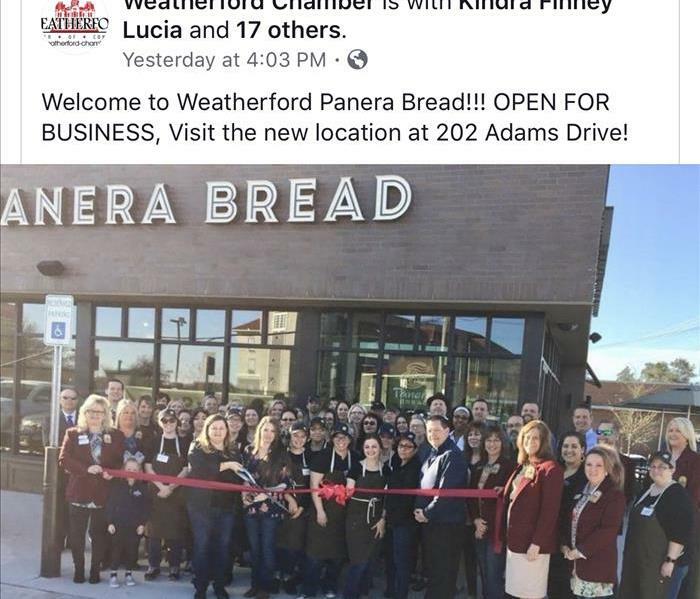 So excited Panera Bread is in Weatherford! 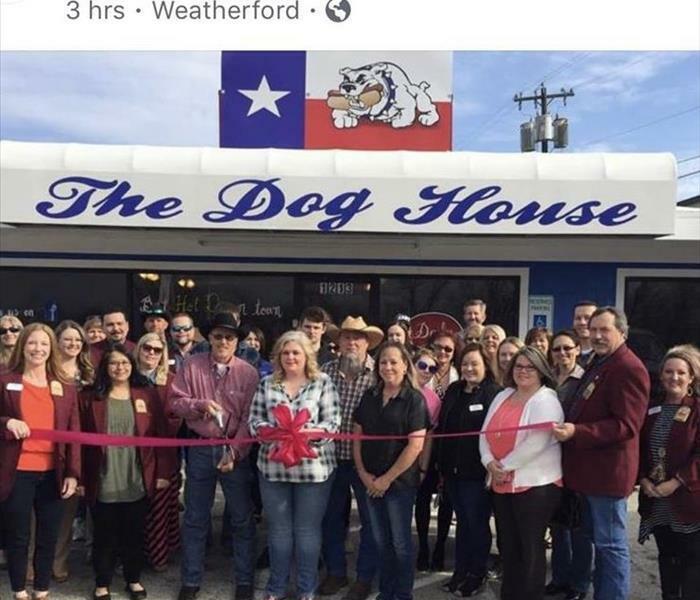 We are so excited to be a member of The Weatherford Chamber. We had the ribbon cutting for Panera Bread. Another great ribbon cutting! We love welcoming new business’s to our community. Any water or fire damage to your home or business? Call SERVPRO!!! SERVPRO of Parker and NE Hood Counties is a trusted leader in the restoration industry, and our highly trained technicians provide 24-hour emergency service. We are dedicated to responding faster to any size disaster with the training, equipment, and experience to respond to your restoration needs. We are also locally owned and operated. What is the IICRC? Institute of Inspection, Cleaning and Restoration Certification. It's a non-profit certification body for the restoration industry founded in 1972. #SERVPRO is certified with the IICRC for water, fire, and mold damage. With IICRC certified technicians are trained to operate at a higher standard within their designated certification. One of the main benefits of an IICRC professional to handle your home is knowing who you are hiring. With the foggy weather comes moisture and mold. The warm weather we enjoy so much is saturated by a significant amount of water, which generated the excessive moisture around you. While many fear what the humidity means for their hair or their skin, have you thought about what it means for your home? In humid climates, homes run serious risk of damage from collecting all of the moisture the air carries. A common result of high humidity levels in your home is mold. Mold grows quickly, in warm, damp conditions and can fester into an entire colony within 24 hours of their spores attaching themselves to surfaces and feeding. As mold grows and spreads throughout your home, allergens and irritants are released into the air which creates a dangerous situation for you and your family. The allergens and irritants can become toxic, causing respiratory problems and other health issues. That's why it's critically important to take steps in preventing mold growth in the first place, We recommend starting with a dehumidifier for your home. Using a dehumidifier will help you maintain optimal humidity levels that are both healthy and comfortable. Running fans, and checking up on your HVAC system will also help keep the humidity down. Make sure everything is running smoothly and functioning properly to help circulate air flow, and if you need help with an inspection you can always call SERVPRO of Parker and Northeast Hood Counties. Call SERVPRO of Parker and Northeast Hood Counties at 817-596-8714. Oh No My Water Heater Broke!!! A water heater breaks, the sink won't stop running or some other clean water source causes damage to your home. You've called SERVPRO of Parker and Northeast Hood Counties and we're on our way, but in the meantime there are some things you can do to help mitigate. You may have noticed I said 'clean water source' in the beginning of this post. Water from toilets, outside the home and any other contaminated source pose a different danger. When water damage has been caused by contaminated water we suggest avoiding all contact and washing your hands thoroughly after contact with contaminated items. During these cold winter months, keeping warm is a necessity. Keeping your pipes warm is just as important for your household/business. One of the most prominent ways that households flood is because pipes freeze and the metal becomes hard and compressed over night. Once the water is turned back on, the pipes heat up, expand, and bust. This is what leads to flooding water in the house and a massive mess. Nobody wants that! It is important to keep your pipes warm during these winter months to avoid this predicament. House floods can cause some major problems especially during the holiday season. If you have any questions on how to avoid this issue, please do not hesitate to contact us at (817) 596-8714. Flooding and water emergencies don’t wait for regular business hours and neither do we. SERVPRO of Parker and Northeast Hood Counties provides emergency cleaning and restoration services 24 hours a day, 7 days a week—including all holidays. Flooding and water damage is very invasive. Water quickly spreads throughout your home and gets absorbed into floors, walls, furniture, and more. SERVPRO of Parker and Northeast Hood Counties arrives quickly and starts the water extraction process almost immediately. This immediate response helps to minimize the damage and the cleaning and restoration costs. 3/29/2019 - Are you ready for April's Showers? 3/29/2019 - Did You Know? 3/4/2019 - What is IICRC? 3/4/2019 - Oh No My Water Heater Broke!! !